Christopher Joy and Zachary Keeting visit the studio of artist Vincent Como. Como descirbes his interest in "the idea of this surface, this pristine plane that references monochrome painting, references this history ingrained in modern art, and then like a black hole, it's collapsing on itself… succumbing to the weight of its own history." 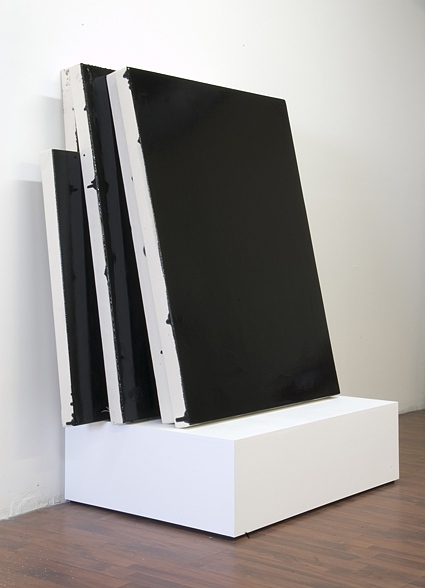 He continues: "The stacked canvases are definitely about that pristine monochrome surface, but also that surface failing to achieve perfection… reiterating that over and over with each successive canvas so it becomes this monument to its own failure... a lot of the work is about tradition, modernity and this utopian ideal and the impossibility of that ideal."